KENNEDY SPACE CENTER, FL--The Atlantis astronauts are working through a busy day of heat shield inspections, docking preparations and rendezvous rocket firings to fine tune the orbiter's approach to International Space Station. Docking is targeted for 11:07 a.m. EDT (GMT-4) Sunday. Space shuttles normally fly with crews of six or seven, but just four are flying aboard Atlantis -- commander Christopher Ferguson, pilot Douglas Hurley, Sandra Magnus and Rex Walheim -- to minimize rescue scenarios in case of a major problem that might prevent a safe re-entry. But on the flip side, there are fewer hands available to do the same amount of work. "It will be challenging to get through that inspection with a reduced crew complement," said Flight Director Kwatsi Alibaruho. "But this crew has practiced considerably to be able to develop a flow or a routine, if you will, to where even though they have fewer hands available in the shuttle they'll be able to get through these inspections in the timeframe that's been allotted." The astronauts planned to spend most of their day Saturday inspecting the shuttle's heat-resistant nose cap and wing leading edge panels to make sure no damage was incurred during launch Friday. 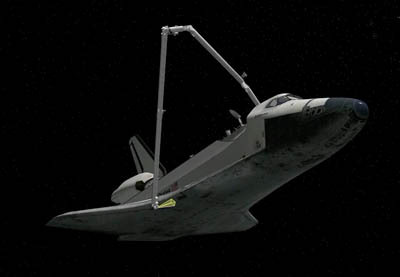 Using an instrumented boom attached to the end of Atlantis' 50-foot-long robot arm, the astronauts planned to inspect the right wing first, followed by the nose cap and then the left wing. "The orbiter boom sensor system, the OBSS, will be maneuvered into position to start survey of the starboard wing," said Alibaruho. "There, the various sensor packages on the OBSS, which include a high-resolution still camera, a laser range imager as well as a video camera, will sweep over the critical surfaces of Atlantis' thermal protection system, looking for any imperfections, any damage that might have been caused by ascent debris or anything that might compromise Atlantis' capability to perform a safe re-entry. "After inspecting the wing leading edge and also areas of the (right-side) payload bay door, the OBSS will inspect the nose cap, which is also made of the same reinforced carbon carbon material that's on the leading edge of the wings. Once that inspection is complete, the OBSS will move to the port wing and conduct similar inspections there, again, looking for imperfections, orbital debris damage, ascent debris damage and anything we might need to go address. "We'll conclude by inspecting the port payload bay door as well as some of the areas where umbilicals were attached prior to launch." Along with the heat shield inspections, Ferguson and Hurley planned to carry out two rendezvous rocket firings to refine Atlantis' orbit and approach to International Space Station. The astronauts also planned to check out laser range finders and other rendezvous tools that will be used during final approach to the station Sunday. A mission status briefing is planned at 2 p.m., followed by a mission management team briefing at 4 p.m. to review launch and any issues that might be under discussion.